Today’s episode of Kumkum Bhagya starts with Abhi (Shabir Ahluwalia) helping Daadi climb up the stairs of the temple. She tells him how much she misses having Pragya (Sriti Jha) around. 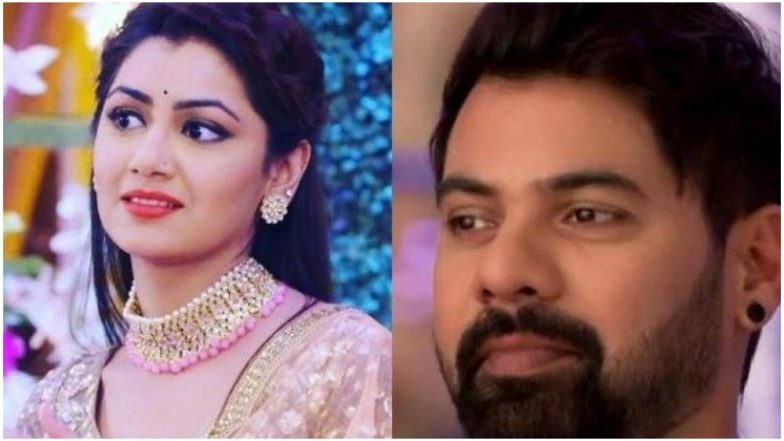 She also tells Abhi that for every Poornima puja she asks God to bring Pragya back to their lives. Abhi tries telling Daadi that he is fine in life without Pragya. Daadi, in turn, reminds him of all the times Pragya took care of him more than any regular family ever could. Hearing her words Abhi begins thinking of Pragya too. When Daadi goes inside the temple to pray, Abhi waits outside and makes a call. Meanwhile, Pragya who is travelling in auto has to stop when the rickshaw breaks down. She gets out the auto when she sees the temple and decides to go and pray there. While she is walking up the stairs Abhi is standing with his back towards her talking on the phone. Abhi knocks over a plate full of things meant for the temple prayers. Pragya who was standing behind him gets the red Kumkum all over her face when it flies. Abhi apologizes to her but doesn’t recognize her face behind the colour. Pragya’s spectacles are filled with colour and she can’t see a thing. However, she realizes that the voice sounds like Abhi’s. Abhi rushes to get water for Pragya to wash her face. Another woman offers Pragya a handkerchief with which she wipes her face. She then goes around to find Abhi because she heard his voice. Back in college, Prachi runs into Ranbir and calls him out for flirting with any girl who gives him attention. They both have an argument where Ranbir admits to Prachi that he doesn’t think she is a robber. This consoles Prachi, who has been having a rough day. In the precap, Dadi tells Abhi that Pragya returned and is here. She asks Abhi to bring her back. Abhi runs behind Pragya calling her. Pragya also runs.